A group of schoolchildren caught up in the London terror attack sat in the Houses of Parliament and sang as chaos ensued around them. 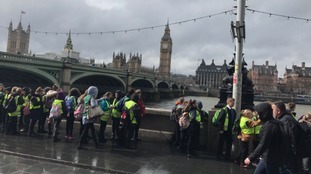 53 year six pupils from St John and St Francis School in Bridgwater, Somerset, were on a trip to the Palace of Westminster when the news broke. When Parliament went into lockdown they were told they couldn't leave - so started singing. The school said the pupils are aged 10 and 11 and were waiting inside Parliament's Education Unit. A spokeswoman said: "It is the safest place they could possibly be. They have no idea how long they will be there."